Demons Never Lie is a graphic adventure made with voxel and low-poly where even your soul is at stake. An incredible and dark story with the typical elements of the classic point&click; and visual novels. An exciting interactive experience with a unique atmosphere. STORY After an awful life, John's soul is ready to say goodbye to this cruel world. In that moment, a demon called Ocaso, appears in front of him. The mysterious creature offers John the opportunity of being young again, having the life he's always dreamed of. In exchange of his soul, of course. Will John accept his offer? And, if so, what will be the consequences? 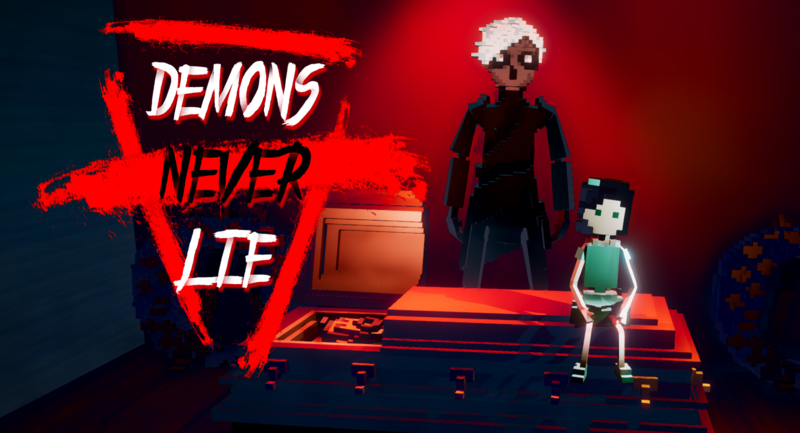 Demons Never Lie is a graphic adventure made with voxel and low-poly where even your soul is at stake. An incredible and dark story with the typical elements of the classic point&click and visual novels. An exciting interactive experience with a unique atmosphere. After an awful life, John's soul is ready to say goodbye to this cruel world. In that moment, a demon called Ocaso, appears in front of him. The mysterious creature offers John the opportunity of being young again, having the life he's always dreamed of. In exchange of his soul, of course. Will John accept his offer? And, if so, what will be the consequences? - Play as John, help him to fix his life, avoiding terrible past mistakes... with a demon on your side. - 3D graphic adventure with classic point&click and visual novel elements. - Indie game with charismatic voxel characters and beautiful low-poly sceneries. - Emotional and atmospheric storytelling. Sometimes bright, sometimes dark. Just like real life. - You can make a pact with the devil. What else could be better than that? - Available in english and spanish (more languages available soon). A Kickstarter campaign will begin on May 15, 2019. If you liked the demo and want to support me in this adventure, it will mean a lot to me. This game is being developed by a single person with the Unity3D engine. Coming on 2019.